Most people in Jacksonville, Illinois — population 18,454 — are University of Illinois fans. After all, Champaign is just 120 miles from the town. The two places share some similarities, as small population outposts dotting agricultural downstate Illinois. Some residents even know former Fighting Illini athletes. Five years ago, a high school tight end named Blake Hance decided to carve a different path. He was attracted to Northwestern, Illinois’ in-state Big Ten rival, drawn by the Wildcats’ high academic standards, proximity to Chicago and string of on-field successes. Hance turned down offers from the Fighting Illini and four other Big Ten West schools, setting off for Evanston instead. Forty-four games later, Hance has come to symbolize NU’s recruiting prowess in the Land of Lincoln. He is among a handful of key players who spurned his home public school for the small, private outpost north of Chicago, many of whom have spurred the Cats to recent heights as the Fighting Illini languish at the bottom of the conference with a revolving door of coaches. Senior quarterback Clayton Thorson of Wheaton, who has started 50 games and led NU to its first-ever division title this year, is one such player. Running back Justin Jackson of Carol Stream, a 2017 graduate who holds the school’s all-time rushing record, is another. Hance, who has earned all-conference recognition and made 36 consecutive starts at one point, is just one of many. When Lou Ayeni returned to his alma mater in February as the running backs coach and recruiting coordinator, it didn’t take long for coach Pat Fitzgerald’s prospect-hunting priorities to sink in. The Cats’ focus on recruiting locally is also evident from the outside. The program parrots on social media its “Homegrown” talent, a nod to players who prepped in Illinois and stayed close to home. Twenty of the 108 players on NU’s current roster list Illinois hometowns. That number is far smaller than for other Big Ten schools — Indiana has the second-fewest in-state players at 38; Penn State leads the conference with 62 from its own state — and is down slightly from past Cats’ teams. Still, the 20 Illinois players are more than NU has from any other state, and several are key contributors. That includes six of the Cats’ 22 starters last week against Minnesota, including the quarterback (Thorson), two high-profile pass-catchers (receiver Flynn Nagel of Lemont and superback Cameron Green of Buffalo Grove) and the left side of the offensive line (Hance and guard J.B. Butler of Plainfield). Reserve receiver Riley Lees of Libertyville led the team in catches. Fitzgerald himself is from Orland Park. Some in-state prospects wanted to be close to home. Others, however, were more drawn by other elements of NU’s program, from team fit to facilities. Some, like Green, cited academic standards above all else. Green, an academic-focused recruit and Illinois native who picked the Cats over the Fighting Illini, is far from alone. Academics is a major part of every prospect pitch, Ayeni and MacPherson said. And the Cats have gotten a steady portion of each recent recruiting class from in-state players, despite unusually restrictive admissions standards and a less-established hometown footprint than for some large state schools. Aside from 2016 and 2017, NU has signed between four and six in-state players each year since 2013; three of the Cats’ 16 commitments for next year’s class are Illinoisans. The half-dozen local letters of intent Fitzgerald received for the 2018 class are the most since 2008. Devin O’Rourke is among those recent signees. The 6-foot-6, 248-pound defensive end was a four-star recruit and the No. 3 player in Illinois for the 2018 class, according to 247Sports. And the Mokena native’s much-followed recruiting process crescendoed when he picked Northwestern over a bevy of other programs, chief among them the Fighting Illini. Clayton Thorson (left) and Justin Jackson stand in the backfield in a 2017 game. O’Rourke cited several factors in his decision, like the ability for his family to watch him play on a regular basis. In an interview shortly after he made his choice, he also named two factors central to the Cats’ recruiting pitch: classes and Chicago. O’Rourke played in the Cats’ first four games but has not appeared since, likely to preserve his eligibility to be redshirted. Though he recorded just two tackles — both in NU losses — he is expected to be a major part of the Cats’ pass rush going forward. With his decision, O’Rourke continued an off-the-field winning streak for NU over its rival to the south. Including O’Rourke, seven Illinois-based recruits since 2013 to earn four-star designations selected a school within the state. Five have chosen to play in Evanston, including Thorson, the second-most prolific passer in program history, and Jackson, who now plies his trade for the Los Angeles Chargers. All five of those players — including quarterback Matt Alviti (2013) and defensive back Parrker Westphal (2014) — also had Illinois offers. Only one of the two who chose the Fighting Illini, 2013 quarterback Aaron Bailey, also held an offer from the purple and white. Fitzgerald cares little about which programs he beats out for top players — “we’re going to recruit who we recruit,” he said — but his local stars have had far different careers than Illinois’. Bailey played 14 games as a backup before transferring to Northern Iowa, where he excelled at the FCS level. Gabe Megginson, a 2015 offensive lineman who did not receive an NU offer, finished his career at Illinois State. Some of the Cats’ prospects didn’t pan out. Westphal appeared sparingly as a reserve defensive back as an underclassman, and left the program after last season. 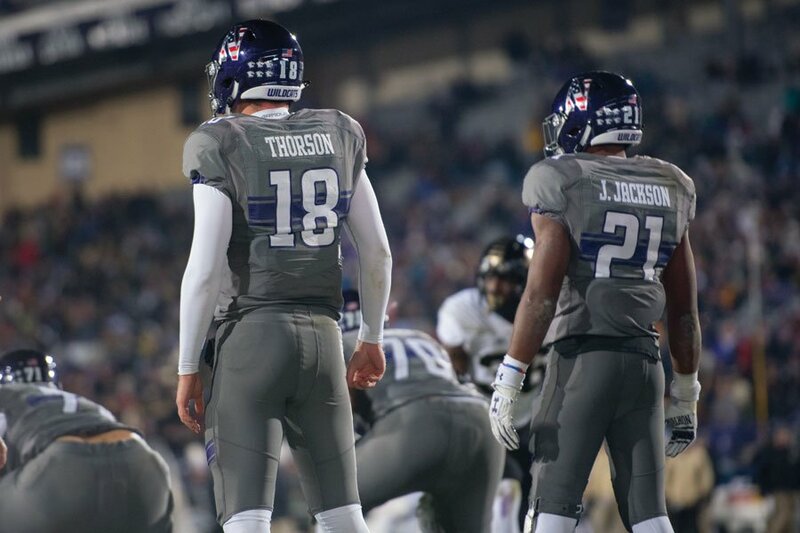 Alviti lost a quarterback competition to Thorson in 2015 and never started a game, though he played a major role in last year’s Music City Bowl after Thorson was injured. In Thorson and Jackson, however, the Cats have proof of how highly-touted local high school players can become stars at a college program in their proverbial backyards — results unmatched by their rival. In recent years, NU’s success on the field has matched its prowess in high schools. The Cats have won the Land of Lincoln trophy each of the last three seasons, and are heavily favored to do so again this week. NU is bowl eligible for the fourth straight campaign; the Fighting Illini’s season will end after 12 games for the fourth consecutive year. That success is not lost on Thorson. Speaking after Saturday’s win at Minnesota, with Lees seated to his right, he credited the people around him. Many such people — his coach (Fitzgerald), his longtime backfield partner (Jackson), many of his top receivers (Nagel and Green) — also grew up in his home state. Amid a litany of coaching changes, the Champaign-based program has consistently recruited a high volume of in-state players. Three times in the last six years, the Fighting Illini have signed at least seven local prospects; twice have Illinoisans comprised at least a third of the class. The Fighting Illini placed above NU in 247Sports’ marks each of the last two seasons, as they did in 2013 and 2015, though larger classes have often helped the downstate school’s marks. 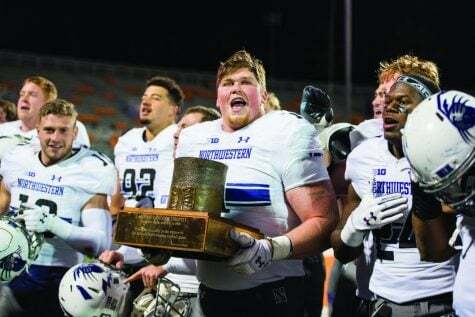 Northwestern players celebrate with the Land of Lincoln trophy in 2017. Despite their shared geographic interests, however, NU and Illinois work in far different arenas. None of the Fighting Illini’s 30 in-state signees since 2014 held offers from Fitzgerald. Eighteen of the 20 in-state players on the Cats’ roster are from Chicago or its sprawling suburbs. Hance, thus, is the exception. 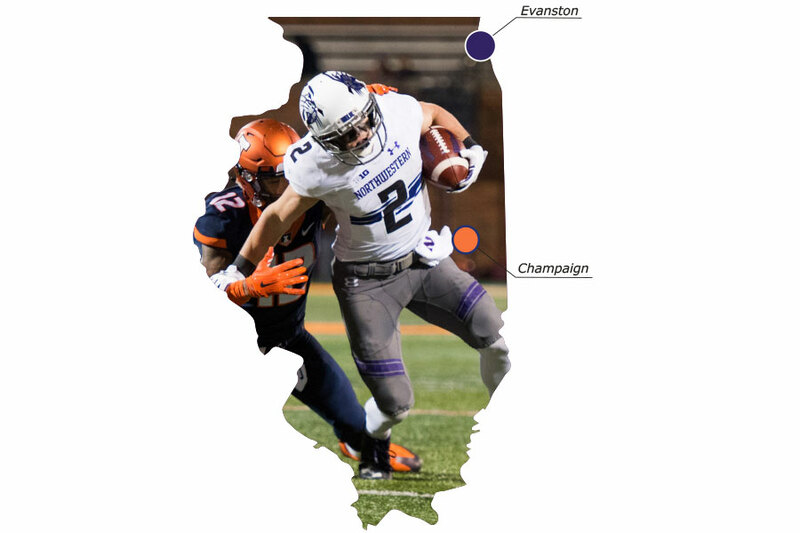 Jacksonville is 255 miles from Evanston, and the town’s one public high school does not send a regular stream of players to Northwestern. Still, coming to an urban area enhanced the draw for the 6-foot-5, 310-pound tackle. On Saturday, he’ll play a critical role on the Cats’ offense as NU seeks to hoist the Land of Lincoln trophy for each of Hance’s playing years, overwhelming the bumbling team that rules his old home. Butler, a fellow senior who visited the Fighting Illini during his recruiting process, will be beside him.